The condition of your local housing market dictates which approach will ultimately lead to more sales. Research from the Keller Center at Baylor University shows that in healthy markets, a mix of 60 percent attract-oriented and 40 percent seek-oriented activities delivered the highest lead generation conversion. In weak markets, just the opposite is true. There, a 60–40 emphasis on seek strategies—phone calls, networking, and acquiring referrals—yields more appointments and, ultimately, closed transactions, says Chris Pullig, who conducted the 2008 study of about 1,200 real estate professionals. Read on for more enlightening research, as well as great ideas from your peers, on how to build thriving and sustainable business—one relationship at a time. Eventually, those connections may lead to business—but they don’t have to start there. Tip: Turn every interaction into a business building opportunity. Formal networking or referral groups, such as chambers of commerce or BNI, can help you expand your reach, too. BNI is an organization with chapters across the country. Only one person per professional specialty joins each chapter. The reason: Pros from different fields network and swap referrals. You can find success through routes that fit your particular interest, too. Diana Baylor, a sales associate with RE/MAX Masters in Covina, Calif., builds relationships through the California Women’s Conference and charity events benefiting cancer prevention programs. Tip: Connect deeply via online social networks. Tip: Strengthen your reputation in an environment where there’s no sales pressure. Tip: Have a “wingman” sing your praises. Boasting about your own sales record and accomplishments can come across as arrogant, says Kurt W. Mortensen, author of The Laws of Charisma (AMACOM, 2010). But if you can get others to say it for you, it’s powerful. Getting friends to introduce you to their peers, for example, gives you built-in credibility, Mortensen says. Testimonials on your Web site or LinkedIn account can be just as powerful. “Written reviews from satisfied customers enable trust to be formed more quickly,” says Michael Davenport, a broker-associate with King Realty Associates LLC in Sarasota, Fla.
You’ve made the introduction and extended the handshake. Now, how do you keep this budding relationship growing? Tip: Start off with a blitz. Get in touch with a prospect eight times within eight weeks following an introduction. The “8×8” program is what Donna Boylan, productivity coach at Keller Williams Consultants Realty in Dublin, Ohio, teaches agents for keeping in touch. The program centers on the idea that people need to be exposed to something eight times before they remember it—and that “it” includes you. The forms of contact will differ (for instance, phone, e-mail, postcards, and so on) and should be tailored to that person (such as potential first-time home buyer or seller), Boylan says. The content could include anything from a “thinking of you” card to mortgage information to a market comparison of the person’s neighborhood. Tip: Get attention with the occasional less-than-serious missive. Need to add pizzazz to a blog post, e-mail, or other communications? Have some fun: Hallmark offers up a list of nontraditional “holidays” to celebrate. For example, in honor of “National Dress Up Your Pet Day” on Jan. 14, you could promote a contest on your social networks for best-dressed pooch. Invite your prospects over for a sweet get-together on Feb. 7 to celebrate “National Chocolate Fondue Day.” On Feb. 25, swap the best chili recipes on “National Chili Day.” Or just send a thoughtful card in honor of Feb. 7, “Send a Card to a Friend Day.” Silly occasions offer a vehicle for making a fun and memorable connection. A Keller Center study, “What Do Consumers Expect From Agents?” supports the effectiveness of humor in business; a real estate agent with a good sense of humor is more likely to have a positive reputation as someone customers want to work with, according to the 2008 report. Be sure to balance the entertaining with the useful. You’ll find a vast array of valuable content on buying, selling, and maintaining and improving your house at HouseLogic.com’s REALTOR® Content Resource. The handouts are free of charge for NAR members and customizable. Prospects will love your tips on buying, selling, energy efficiency, money-saving remodeling ideas, and more. Tip: The thought really does count. Handwritten notes are a great way to acknowledge birthdays, graduations, wedding anniversaries, a new baby, and even a pet’s birthday. But sometimes you may want to offer something extra. Carlyn Parker, a sales associate with Real Living CO Properties in Denver, tailors her approach to the client. For example, for a relocating family on a house-hunting trip over Easter weekend eight years ago, Parker made up Easter baskets for the small children, who were 2 and 4 at the time. Now she pays a yearly visit to the family with Easter baskets in hand. The visits help keep the relationship alive and have led to three real estate transactions so far. For other families, she’ll try other things, such as “wine of the month” club. Dolores Mauriello, ABR, a broker with Century 21 Gemini LLC Realty in Wayne, N.J., offers a Lowe’s 10 percent off coupon to those she meets at open houses. All they have to do is provide their e-mail address so she can follow up. She uses the Lowe’s REALTOR Benefits® Program, a free service available to REALTORS®, to send a customized, real estate newsletter, along with the coupon. Tip: Find reasons to get face-to-face. Avoid becoming just a name on someone’s social network or a spam in an e-mail in-box. Put in some face time with your prospects. Some real estate professionals do this by holding an office open house, a special dinner, or a fund-raiser for a local charity. Sheri Bailey, a practitioner with Keller Williams Boerne in Boerne, Texas, invites prospective female buyers to lunch every month or so. “Especially if they are new to the area, my clients love to try out a local restaurant while we catch up on the latest happenings in their lives,” Bailey says. “For the price of a sandwich or salad, I can stay in touch.” Even if there’s no explicit conversation about real estate, she says the meetings are valuable to strengthen those relationships. Remember, though, in order to count such a lunch as a business expense for federal tax purposes, the main purpose of the lunch must be business; you must discuss business before, during, or after the meal; and you must have a reasonable expectation of generating income or some other business benefit. Tip: Don’t be afraid to have a point of view. Blocker’s research, which tested various approaches in real estate for turning leads into clients, shows agents are most effective when they not only adapt to their client’s style but also look for ways to make clear, explicit suggestions that advise a specific course of action. “The agent who offers expertise instead of ‘here’s a stack of things to look through’ tends to have a higher success rate,” Blocker says. Housing data, sales scripts, and incentives can all be useful tools to a point. But relying on them too much can actually backfire, according to Blocker’s research. “There’s a tremendous amount of housing data available,” Blocker says. “Too much information can sometimes cause people to ‘check out’ ” or feel overwhelmed, particularly if the information is presented with no explanations or recommendations. If you offer a packet of information and they actively consult it, they may want more. If they shove it into their bag and never refer to it again, they may not be information-oriented. And while sales scripts can be a useful guide to navigate various client situations, they can potentially undermine those interactions. Relationships are complex. People have unique personalities, life histories, and goals that don’t fit into one boilerplate script. So be flexible enough to go off script and tailor your presentation to individual clients, Blocker says. A considerate gesture can go a long way—and it doesn’t have to cost money. Recommend a great contractor or painter who will offer a good price; take the time to ask how someone’s doing after a surgery or family death; or refer their teenage child for a job. Gratitude is a powerful emotion that makes others want to reciprocate. To feel gratitude, others need to feel that your actions and concern for their well-being are sincere and not selfish or commission-motivated. So, by all means, seek opportunities to reach out. But do it simply for the wonderful bond you’ll create. 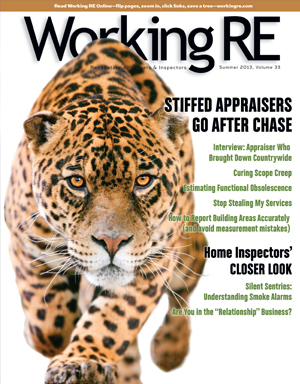 *Reprinted from the January/February 2013 issue of REALTOR Magazine by permission of the NATIONAL ASSOCIATION OF REALTORS. Copyright 2013. All rights reserved.